customers can cancel their reservation free of charge up to 2 days before arrival. This is a place of peace and love, and letting go. The kitchen vibe is amazing! The staff is now family to me. I couldn't have dreamed of more. Such a wonderful hostel. Great location and decorated with tons of characater. Unique place with character, ideal location and great staff. Great place for our short trip to Lisbon. 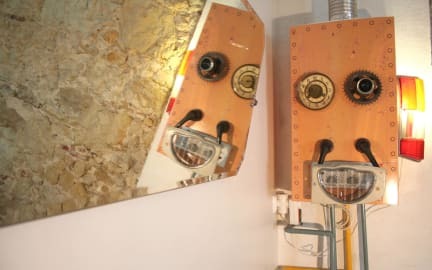 Fun little quirky hostel in a great location on the Lisbon riverfront! My only complaint that it is no sign and it's a little hidden and hard to find at first. The hostel lived up to its quirky description, I slept so comfortably here and felt right at home. The staff were lovely and I was very very happy here. 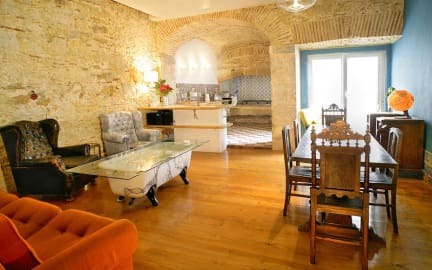 I would definitely recommended this to anyone staying in Lisbon, great location, I felt like I was in the middle of everything and nothing was too far away. Very unique little hostel. Quiet but with a welcoming atmosphere. The directions provided by the hostel made it easy to find. We stayed in a four bed dorm, beds were comfortable. Shower was nice-hot water in abundance. Well equipt kitchen if you want to cook with supermarket 1min walk away. Breakfast included was simple but appreciated. It’s a great location, close to the “pink street” and only 5min walk to the Bairro Alto neighbourhood, 10min walk to Alfama. Lisbon Calling is unique because you feel as if you’re staying a home but during our stay that was often it’s downfall. The room are on top of each other and it’s very loud if one person gets up. The rooms are clean but there are only 2 showers and 2 toliets for the entire hostel. We were left buzzing the doorbell 5 times before someone on the staff answered. The rooms have no type of locking system other than a locker so anyone can walk into the room at anytime. The staff & breakfast was nice.